Is there anyone who doesn't love potato fry? If so, we should check out what's wrong with them..
Wash well and cut potatoes to tiny cubes. In 2 spoons of oil, temper mustard,cumin,saunf. Add chopped onions, saute till pink. Once half boiled, add salt. Once nicely cooked, add sambar powder/chilli powder, drizzle some oil on top ,saute for about 5 mins. Switch off. --Little things like, adding saunf in tempering, adding sambar powder will give a great flavour to this dish. golden cubes look so yumm.. 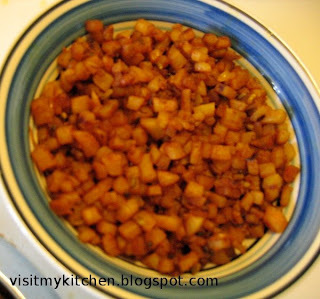 These potatoes are my favorite...I make them with regular masala powders..never added sambhar powder . So next time, its going to be your version .